With 10.10 just around the corner – here is our quick guide to what you might want to know. Each new OS add some features, many are visible (such as new iMessage, or iCould Drive); some are not (such as Grand Central Station support). Many features you may not see until your favourite app starts to support them. Sometimes you need to update to give support for a website you want to use (Netflix or iPlayer spring to mind as these have recently been upgraded; loosing support for many older browsers). General advice is to make sure you are running up to date software (which means if you buy a new printer or some other hardware you should have no problems running it and all the latest security features and malware protection are then enabled). We always suggest caution moving as soon as new software is released – especially if you have a current project which may be affected by it (memorably we had a customer who was printing a book and moved to the new iWork which changed his fonts and changed the whole layout two days before it was going to be printed!). This is especially true when moving more than one point release (i.e. from OS 10.7 -> 10.10 might change an awful lot with unexpected consequences). So far it appears to run in the same hardware as 10.9 (Mavericks) – nothing in any of the beta versions suggests otherwise. You can search our website by Serial number or Model ID and our pages will be updated as soon as we can after the final revision is shipped. Mavericks really liked at least 4GB of RAM – the min spec says 2GB – but from our testing and customer comments – 4GB was the min to prevent slow downs. We would recommend that you have at least 4GB. Our model ID pages will give you an idea of the max RAM you can have fitted. Clone? Time Machine? Dropbox? or burn off to DVD? So, if you take away just one thing from this article; please let it be this. The Mantra which must rule any OS upgrade is Backup, Backup, Backup. OS upgrades reveal issues with hardware like nothing else – they involve moving and removing many gigabytes of data – touching parts of the hard drive which may not have been used since it was in the factory, testing parts of the computer with new extensions and k.exts and new levels of encryption and security. We see a lot of hard drive failures coming in straight after an OS upgrade as the extra strain on a failing drive can sometimes be the final nail in its coffin. The MacUpgrades preferred method is to clone your drive using the wonderful utility Carbon Copy Cloner. This gives you a bootable volume – so if it all goes wrong you can boot and be where you were before you upgraded. Time machine has the disadvantage that, other than being told that your data is backed up in the system preference, it is not tested until after the deed is done. We would probably never hear from customers for whom Time Machine worked perfectly; but we do hear from customers who have lost data because they thought it was backed up. Our advice is to double check you backup – try restoring a file or two to another volume, launch the Time Machine browser and check the backup dates. An alternative (and rapidly growing in popularity with very fast home broadband helping) is to simply store all key documents in an online storage like Dropbox. This is great if you know where all of your important files are – just don’t forget things like iPhoto Library and eMail attachments folders. Getting the best from your Mac for Yosemite. To get the best from any Mac we recommend a couple of simple steps. 1) Make sure you have enough RAM to prevent slow downs. 2) Give your Mac the best speed boost you can – put an SSD in and use it as the Main OS and Apps drive. SSDs really do make a world of difference to the speed of a Mac – see some of our other posts for more detail; but to put it simply; you really do want an SSD. TRIM is a standard which is used by some SSDs to clear out data from areas of the drive – usually when the system is idle. This is important since SSDs need to delete data before writing new data; otherwise they need to do it just before writing the data. Several posts have reported drives with TRIM enabled appear to not work under Yosemite beta. Digging around this appears to be to do with the new security features in Yosemite – that is all kernel extensions need to be signed by recognised vendors and the previous way of enabling TRIM was a custom k.ext! The advantages of TRIM seem to be limited; the benchmarks disagree between a small speed advantage and a smaller speed advantage. Will my Apps all run OK? Many developers do not announce if their pet project will run on a new OS until it is released (or at least left beta testing – a stage call Golden Master). Some will update their site with details – some are tested by users. A great site for checking is RoaringApps which lists from various sources to give you an answer. This a special enclosure or caddy made to fit into the form factor of an internal optical drive inside your Mac and give you the ability to add a Hard Disk Drive (HDD) or Solid State Drive (SSD) with a SATA connection (you can even use a SATA drive in a IDE optical drive space, although the performance is too slow for an SSD). These days; we are finding; more and more that you do not need a working optical drive. Mac OS updates across the internet, Applications are downloaded or bought via the Mac App Store. Adobe now have the Creative Cloud. Even Microsoft Office is now a download (some considered this the last of the must have apps to be on optical disk). Which Machine and which Opti-bay caddies ? All intel Mac Based laptops, Mac Mini’s and iMacs can use an Opti-bay caddy. They use different ones depending on the height and connection type. Our serial number checker or model ID checker will tell you exactly which Opti-bay you need and which drives will work in it. 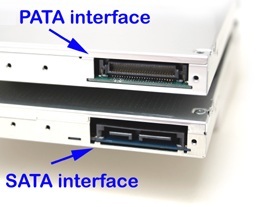 They exist in two different connection types IDE(PATA) and SATA,and two different heights (9.5mm and 12.7mm) depending on the machine. Below is a picture of the two different connection types. This is only useful if you’ve taken the drive out, but relevant for identification purposes. These are found in all Mac Minis, iMacs, MacBooks and Macbook Pros produced between 2006 and around 2009 when SATA based optical drives came in. These caddies have an IDE connection on the outside for connection to the motherboard and a SATA connection internally to allow connection of modern hard drives. IDE is a slower connection type with a limit on how much data can be transferred at any one time. This is not important for optical drives but does restrict the maximum throughput you can get from the Opti-bay in these machines. Which configurations will work and which are best ? For machines with IDE optical drive connections we recommend only using a standard rotational hard drive (HDD) in this bay due to the limitation of the IDE controller. HDD options for this bay go unto 2TB in size, a good combination is to replace the main hard drive with a Solid State drive and put a large rotation into the optical drive space. Then running the OS and applications from the SSD and use the rotational for less speed important data storage tasks. There are not external USB caddies for the old optical drives taken from these machines, but we do sell very inexpensive external USB Samsung Optical drives which you can use if you want to keep your ability to use optical media at a later date. SATA connectivity for the optical drive was introduced into the Mac ranges in late 2008 and early 2009. The first iMacs with it were the 20 and 24 inch Early 2009 machines. The first Mac Minis were the Early 2009. All MacBook unibody machines (white and aluminium) and MacBook Pros with black keyboards have SATA optical drives. The SATA connection allows for faster drives and SSDs to be put into the optical drive space. This second options allows for more options and greater speed. With SATA Opti-bay caddies you can use either standard rotational HDDs or SSD drives in the bay. Using the SSD for fast access for operating systems and applications, leaving the larger rotational for non speed sensitive application. A good, but a little dated article on how to separate your data out in this fashion can be found here . Another approach using combination of SSD and HDD is to create a fusion drive. This uses two physical devices one SSD and one HDD and combines them together in software to give a single logical volume which automatically in software decides which files give greatest benefit from being on the SSD and moves them automatically. Much like the newer iMAcs and Mac Minis offer. You can create a fusion drive with any size of SSD and rotational but it is more common to go with a smaller (sub 500GB) SSD drive and a very large rotational. The setup is more involved (or we can do it for you) but once setup you don’t have to worry about where anything is stored. A good guide from the helpful chaps at Macworld magazine is here . iMacs are particularly good for these two types of upgrades as the main drive can be replaced with a 3.5″ drive (unto 4TB at time of writing) and with an SSD in the smaller opti-bay space. You can of course install two SSD drives into these machines, (unto 1TB size each at time of writing) for even faster performance, or use a RAID setup to make the machine fly. RAID stripping is great for speed but a good backup strategy must be employed. We also sell optical drive USB enclosures so you can turn your internal optical drive into an external USB one should you find you need one. How difficult are they to fit ? We supply parts for your to fit yourself, or we offer an installation service from our Cambridge repair centre Laptop prices are £29 + Vat and iMacs £49 + Vat. You can send or bring your machine to us for upgrade or use our guides and tech support to install at home. We even offer on site installations on your premises. Difficulty varies greatly by the type of machine. Generally the optical bay replacements are no more difficult than replacing the hard drive (apart from the White / Black MacBooks with removable batteries). Using our serial or model number checker you can see a link to an instructional video detailing the process but a brief synopsis is below. The easiest ones to do are the MacBook Unibody and White unibody and Unibody MacBook Pros with black keyboards, they are not much harder than the hard drive and it can be done in half an hour with less than 15 screws. Simply transfer the old mountings and cables to the caddie taking care not to damage the cable. Then followed by the Aluminium keyboard Macbook Pros, all the screws around the outside and inside the battery bay, about 35 screws and 40 minutes to do (for a first time). Then the white iMacs, Remove the memory cover, the bottom screws and use a credit card in the back vent to release the white bezel. Then remove the screws holding the screen in place and disconnect the video and inverter cables. The optical drive is held in place with 2 / 4 screws transpose the bracket and screws to the Opti-bay caddy and re-assemble. Takes about an hour. More difficult are the Mac minis and the later aluminium iMacs, we normally recommend our installation service for these machines are there are more gotchas and potential for problems. We hope you have found this guide useful. Please contact us if we can be of any further assistance. Being a little outside of the main shopping districts of historic Cambridge has it advantages. There is plenty of free parking and many fewer people on the pavements taking pictures of the historical sites. However; some of our upgrades take a few hours and if you are travelling some distance to see us (we had some visitors from Manchester the other day) you may want to see the sights. Here is a list of local attractions which you can spend a couple of hours (or longer if you wish) whilst you Mac gets a speed boast! If you would like us to upgrade your Mac on the same day while you explore Cambridge or while you wait please get in touch and book yourself in advance to ensure that engineering space and products are available. See our reflow services for MacBook Pros and iMacs. Back in 2008 legislation called ROHS was made law in the UK. This among other things prohibited lead to be used in solder for certain electrical items such as computers. Apple computers use a Ball grid array (BGA) of small solder balls to connect their chips to the graphics or logic board (rather than using a socket – in order to keep size in check). In these first revisions of machine which had to have lead free solder the combination of the solder and the Nvidia graphics chip did not work well. The Nvidia chips run very hot (even upto 90 degrees under load) and the constant heating / cooling along with the solder mix resulted in dry joints forming. These dry joints result in the problems that occur with these machines. Apple acknowledged these faults in time with an extended warranty scheme in which they would replace the logic board / graphics card of any affected machine but no full recall was made. The unfortunate side effect of the replacement route was that the problem was not eliminated, bad boards were replaced only to fail again some time later. We’ve seen a vast number of symptoms as a result of this faulty solder, as the GPU chip can cause a whole range of problems – some of which exhibit no graphical artefacts. Here are the most common, but we are discovering more every day. Some of these faults can be from other components but as this issue is so prevalent the suspicion will always fall on the graphics card. Our general rule of thumb is – if there is a machine with an NVida 8600/8800 graphics card in it with faults that cannot be pinned down then reflowing the card is quite likely to bring them back to life. In the unlikely event of the reflow being outright unsuccessful, we will refund you half the cost of the work (this refund excludes any delivery/collection charges). If the fault recurs within 3 months of work being completed, we will offer you a choice of a further free reflow, or the same 50% refund. If it fails outside of 3 months we offer a further reflow attempt at half price, but with no further warranty. There are all sorts of DIY solutions that we hear about here at MacUpgrades, from putting the motherboard into your domestic oven, to using a paint stripper on the board. Rest assured that our procedure is NOT like this! – these diy solutions won’t work for long and will most likely cause more harm than good. As such here is a brief outline of our procedure. Reflowing is as much an art as a science and the temperature ranges and durations have taken us a great number of hours to work out to give you the best result – we will not be revealing those numbers (sorry). Once a machine has been identified as a likely reflow candidate the machine is stripped down to the logic board level. For a Macbook pro the heat sink is removed and cleaned. The GPU, CPU and north bridge are cleaned to remove all traces of old thermal paste.The boards are then inspected for any signs of physical damage such as burn or liquid damage. For an iMac the logic board is removed and the graphics card removed and cleaned. The logic board or Graphics card is then prepared for the reflow process. The area around the graphics chips is protected with an aluminium shield to protect the more delicate components from the strong heat that will be used. Thermal probes are then attached to the board with the sensors touching the logic board right next to the GPU. The prepared boards are then attached to the pre heating plate. This Infra Red heating plate is used to heat the board up to an intermediate temperature to prevent the board cracking under the heat load on the GPU. Once the board is up to temperature (taken from an average of the 3 thermal probes) the reflowing can begin. A hot air rework station is used, with the correct size and type of nozzle (to allow equal distribution of heat). The machine is set with a high speed air flow rate and has to be positioned evenly and not too close to the chip. We will then use the thermal profile we have worked out to gently increase the average overall temperature of the board to the level where the solder underneath the chip will melt. Once this temperature has been achieved then we maintain it for a short period of time. That is the reflow element complete. Next the SMC station is turned off and the board allowed to return to the resting plate temperature. This is then reduced slowly to return the board to room temperature where it is allowed to rest for an hour or so. The machine is then cleaned again and re-assembled. We use arctic silver thermal paste to replace the standard paste used and we use only the correct amount – rather than the slathering that Apple seemed to use. The machine is then tested with full load on the GPU for 24 hours straight at 100%. This will then cure the thermal paste. As discussed above the reflow process is not likely to result in a permanent fix. In order to give you the customer an idea of the success rate and longevity here are the statistics. In the last 2 years we have re-flowed over 200 machines, about 140 MacBook Pro’s and 60 iMac 24″ iMacs. Of the successful machines 16 required a second reflow during the warranty period. The average lifespan of the reflow is aprox 6-9 months although there are extremes at each end. It comes down to how damaged the solder / GPU chip as to how long it will last. If you machine is reflowed and falls outside of the warranty period we will reflow the machine for you again for half price. The way we describe the reflow process when selling the service is to think of it as renting more time with your machine whilst you make more long term arrangements. There are technically two other ways to resolve the problem other than reflowing. Replace the logic board. This is expensive (about £300 ish) if you could find a new unused board it might be worth it – however every board that was made is susceptible to this fault and it is highly likely to happen again. Buying a second hand board should not be done under any circumstances as you cannot be sure what has happened to the the board in its life – as mentioned before some people cook these in ovens! Replace the graphics chip along with lead solder BGA. This can be a legitimate way of resolving the problem, however the machinery involved to do this properly is hugely expensive and it would cost more than the machine is worth to do it. You have to be sure of the quality of the parts and the procedure that is being done. As these machines are getting older now we would be unable to make back our investment into one of these systems. Hope this has given you some insight into the problem, and if you would like us to reflow your machine. As always you can contact us on 01223 833412 or use the contact form. In the world of data storage everyone loves a TLA (three letter acronym). But; what do they mean. Why should I care and when is it important to understand the differences. One of the more common questions we get asked about here at our Cambridge Mac Repair centre is the difference between the storage options available for certain Macs. Our lovely serial number checker will give you our compatibility guarantee – but what are the main differences? First we’ll explain the main terminology, then give you some specific examples and our most popular options for some example machines. Traditional rotational hard drives (HDD) have been used in computers for decades and have been the main storage devices ever since. All Macs with Intel processors (upto the MacBook air and Retina machines) shipped with a standard rotational drive as the main storage device). The current protocol used by drives is SATA (Serial ATA), this was introduced to macs with the G5 and has been used up til the MBA and Retina machines. Rotational hard drives consist of a series of metal platters (disc shaped rings) which are moved at high speeds by a motor inside a sealed case. On each platter, and each side is a head mechanism which could be likened to a stylus on a record player this moves across the platters and reads / writes data as it goes at great speeds. Rotational drives are fragile bits of kit and contain fast moving parts, as such they are very prone to mechanical failure, whether that be from a physical drop or due to components wearing out over time. Like with all storage devices hard drives must be backed up all the time. Rotational drives are incredibly inexpensive, at the time of writing a 1TB 7,200 RPM hard drive for all Intel Mac Laptops (pre 2012 and air) is £57 + Vat. About 5p per GB (Giga Byte) of data. At the time of writing the largest 2.5″ laptop drive is 2TB and the largest 3.5″ drives are 4TB (6TB options are on the way though). For MacUpgrades purposes there are two main drive sizes (there are more) 2.5″ for Laptops, and 3.5″ for desktops (the 2012/2013 21″ iMacs are unique in that fact that they use 2.5″ drives instead of 3.5″ but i digress). Then there are the spin speeds these are most commonly 5,400rpm and 7,200rpm. For the most part, and for these purposes, the faster the spin speed the faster the drive will be. In years gone by 7,200 rpm drives used to be significantly more expensive that the 5,400 rpm versions, these days there is very little difference and unless every drop of battery life is important to you we strongly recommend 7,200 rpm in every case. Unless specified as a build to order unit Apple used 5,400rpm hard drives in all its laptops until 2012. The 7,200 rpm was available at extra cost. There are different type of SATA controllers, which limit the maximum theoretical speed at which data can be transferred. The lowest of which is a SATA 150 controller (these will be covered lower down the page) which is a theoretical maximum transfer rate of 150MB/s. Rotational hard drives (5,400 and 7,200 rpm drives) do in the region of 60-100MB/s. You can test your current drives speed using Black magic Speed test. So, the speed of your SATA controller does not matter for these rotational drives. See below for specific machine recommendations. So if you have run out of space, or if budget is limited a rotational drive will do the job just fine, and if you are upgrading from an older slower, or damaged drive you will get a nice little speed boost too. We can supply you parts, or do the installation work for you. Use our serial number checker for the best options for your machine. All recommended products have be qualified and tested by our team prior to being put on the website. Hybrid drives are relatively new to the market and are an attempt to add some extra speed to rotational drives, where a pure SSD is too expensive, or not large enough for the task. Hybrid drives are not to be confused with what Apple call Fusion drives, these are different and are dealt with in its own section. Hybrid drives work by having a small (8GB) sized integrated SSD (solid state disk) on the drive. This SSD portion is not available to use separately and the device is seen as a single volume in disk utility. The drives firmware determines over time the most used files in the system based on the file read count list, as such most used files are automatically moved onto the SSD portion for faster access, until the SSD is used up and then the rotational drive kicks in. This constantly changes and updates over time. Hybrid drives seem to work best for people with fairly consistent repeating workflows – such as people in a non creative environment using the same OS and apps day in day out. In these cases the vast majority of the data is SSD based and achieves SSD speeds. If you works is varied and large then the benefits become less. So, if your budget won’t strech to an SSD then the hybrid is a good option for you. In the laptop world, unless you have a very closed workflow as explained above we recommend a stock 1TB 7,200 rpm drive over the 1TB hybrid – purely because the laptop varients spinning portion is only 5,400rpm. In the desktop version the drive runs at 7,200rpm so performs better overall. Use our serial number checker for the best options for your machine. All recommended products have be qualified and tested by our team prior to being put on the website. Fusion drive is a logical volume created out of two physical devices. It is often confused with a hybrid drive but they are physically different. Apple is currently the only company using the term Fusion drive at the present time in this context. Fusion drives were introduced with the 2012 iMacs and Mac Minis. They use two separate storage devices, one SSD (solid state drive) and one rotational drive combined together to produce one single volume that all data is stored on. The operating system dynamically chooses which items go where, putting essential files and most used items on to the SSD portion and leave the rest on the rotational element. Most fusion drive machines shipped with a 128GB or 256GB SSD combined with a rotational drive of 1 or 2TB. It is possible to create your own fusion drive in software (or have us do it for you) with any sized combination of SSD and rotational drive – for example we have created a 5TB fusion drive in a MacPro with a 1TB SSD and a 4TB rotational. These work very well when you don’t want to arrange your data manually over an SSD and HDD combination. Although most setups we do with a combination of SSD and HDD we setup manually. A solid state drive is a long term data storage device, it stores all your information and allows very fast read and write access to it. From a machines point of view it is treated no differently to a normal rotational drive, only significantly faster. SSD’s are comprised of memory chips, rather than rotating electro magnetic storage discs as are found in normal rotational drives – similar to a Memory stick. The benefits of this are that the drives can have vastly faster access and read / write times – and also that they are not prone to mechanical failure in the same way that rotational drives are. Most new Macs such as the Macbook Air (2010 or later) or the Retina MacBook Pro’s come with SSD’s as standard. These are upgradable to larger SSDs through our website. All Intel processor based Apple computers can be upgraded to have an SSD installed, whether that be as a replacement for the main drive or in some cases in addition to the main drive. With SSDs the speed of your SATA controller comes into play. There are currently 3 types of SATA protocol used in Macs (we are leaving Retinas and Airs out of this for the time being as they use very specific SSDs which dont fit nicely into this description). Clicking on the links above takes you to the compatible drives for your machine! This connection has a maximum throughput of 150MB/s, for these machines we have qualified and tested the OWC Electra 3G range of SSDs which will work at the full 150MB/s speed on these computers. When factoring in additional benefits such as queuing and latency benefits fitting an ssd would feel like a 4x increase in speed of the machine. So taking average boot times to about 20 seconds and apps launching in a couple of bounces in the dock. We’ll have some real world numerical pre and post shots coming to one of our next articles. The OWC Electra can run at speeds faster than 150MB/s but the limiting speed is of your controller, not the drive. Not all SSD drives work well in these machines but we have fully tested each of our products with each machine we state compatibility for. We can supply you parts, or do the installation work for you. Even at SATA 150 speeds it still gives a nice boost to an older machine. Clicking on the links above takes you straight to the drives for your machine! This connection has a maximum throughput of 300MB/s, for these machines we have qualified and tested the OWC Electra 3G range of SSDs and the Samsung EVO range – which will work at the full 300MB/s speed on these computers. When factoring in additional benefits such as queuing and latency benefits fitting an ssd would feel like a 8-10x increase in speed of the machine. So taking average boot times to about 10 seconds and apps launching in a single bounce in the dock. We’ll have some real world numerical pre and post shots coming to one of our next articles. The OWC Electra / Samsung EVO can run at speeds faster than 300MB/s but the limiting speed is of your controller, not the drive. Not all SSD drives work well in these machines but we have fully tested each of our products with each machine we state compatibility for. With this faster SATA speed the benefit for going to SSD is doubled, and can make your mac absolutely fly. We can supply you parts, or do the installation work for you. Use our serial number checker for the best options for your machine. All recommended products have be qualified and tested by our team prior to being put on the website. SSD’s work wonderfuly in these machines and really do change your life! Use our serial number checker for the best options for your machine. This connection has a maximum throughput of 600MB/s, for these machines we have qualified and tested the OWC Mercury Extreme 6G range of SSDs and the Samsung EVO range – which will work in the range of 500-550MB/s speed on these computers. When factoring in additional benefits such as queuing and latency benefits fitting an ssd would feel like a 10-20x increase in speed of the machine. So taking average boot times to about 5 seconds and apps launching in a single bounce in the dock. We’ll have some real world numerical pre and post shots coming to one of our next articles. Not all SSD drives work well in these machines but we have fully tested each of our products with each machine we state compatibility for. With this faster SATA speed the benefit for going to SSD is doubled, and can make your mac absolutely rocket. We can supply you parts, or do the installation work for you. Use our serial number checker for the best options for your machine. All recommended products have be qualified and tested by our team prior to being put on the website. SSD’s work wonderfully in these machines and really do change your life! Hopefully this post will help you decide which route is best for you, if you have any questions please don’t hesitate to contact us! Time Machine on an old G4 tower- more backups for you. Well – what do you do on a quiet August weekday? Well – Apple have a very nice piece of hardware – the time capsule. This has special software which compensates for an issue with WiFi (the issue being a device can drop off a network unexpectedly and completely legitimately – such as walking out of range or shutting the lid on a Mac). The time capsule (as opposed to a classic NAS) has a way of telling the OS that the data has been backed up and so does not run the risk of half a file being delivered so it avoids certain corruptions. However – we did not want to buy a time capsule. We wanted to use an old G4 tower with linux to give us the same functionality (primarily because we have several old G4s which are perfectly functional but won’t run the latest browsers etc). We outfitted the G4 with a small IDE hard disk drive and a large SATA drive via a PCI SATA adapter. A full 1.5 GB of RAM and we were ready to rock. After downloading and installing PPC Debain we were ready to complete the config. There is a very useful guide here which you can follow step by step and now all our machines have a proper backup. No more hard disks under every desk! Now back to the Mojitos and sunshine.